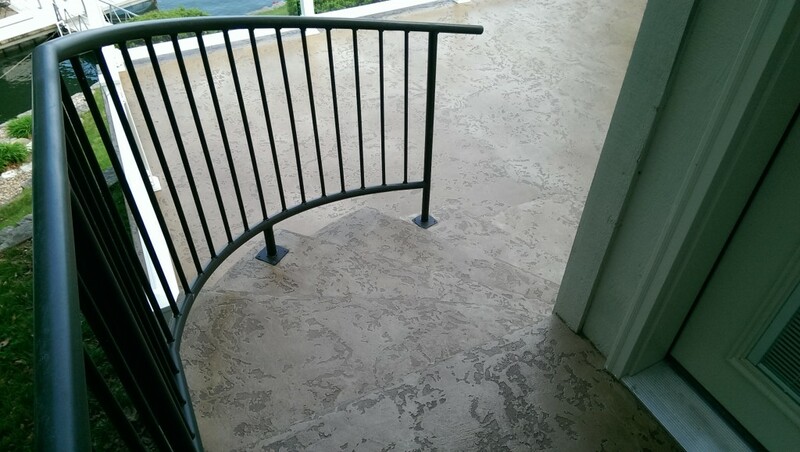 With this patio we started out with a pretty good slab of concrete, it had 3 cracks running from the house all the way to the railing, we of course repaired them did a little grinding (just a few rough spots nothing major) and started our Overlay Process. We did our usual prep work to begin which is always the grinding and repairs, then we go in with a Muriatic Acid wash then an Ammonia Rinse, followed by a soft water rinse, then we hammer the concrete with our 4000 PSI pressure washer and really get those pours of the concrete wide open for our overlay material. Taped up ever ything on the bottom end (walls, railings, posts anything we did not want concrete on) with a 3/4 inch fiber tape, then spread out the base coat slightly darker chocolate than the top coat, just trying to give the deck a more 3D look. Once the base coat was on it was time to paper off everything that we did not want Acid stain on. Now its time for the Top coat of concrete everything is taped off and we were ready for the next phase, the top coat Texture is a Tuscan Slate its about a 85 to 90% coverage rate, so we can see the our base coat, now that the Texture coat is on we are ready to start mixing stain and spraying it on, the Acid Stain will sit in the low pockets of the design and darken the base coat a little more plus it Slightly Marbleizes the top coat Tuscan Slate Texture at the same time, really gives it a nice look. Now its time to apply our premium Sealer, once the 1st coat goes down and soaks in the color starts to really pop, but its the second coat I call the money coat, it brings the SHINE!! 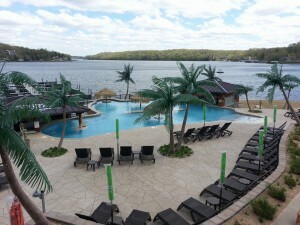 Another Patio saved and Beautified by Custom Concrete Design! Wow what a Job it was right in the rainiest part of the year, well it wasn’t bad we got through this one, started with some really decent concrete made a few repairs and adjustments here and there, but overall it was a great success. We did our usual grinding here and there, fixed some cracks, the Leveling was probably the most challenging thank you John Clary from John Clary Concrete in Laurie MO, your help was priceless. We originally started this Project with hopes to do more than just the pool deck area, but after a late start , some rain and a timeline to get it done we decided to just concentrate on the pool deck alone for now, we will get back over there to get the rest of it done sometime this fall after Coconuts closes for the season, looks like we will have about 5,000 MORE sqft feet to get done then. Anyway we got our first coat down (dark grout) after a week of prep work it went very smoothly, once we had that down it was time to Hand Tape that Entire pool deck you see, wow it was a job let me tell ya, but we got through it and from there once the pattern was laid down we had to get everything around the entire pool deck masked off to contain the over-spray from the Knockdown Finish that was to be laid down. Finally we were ready to spray the surface, out first coat went down really smooth, same with the second, next was the highlight coat, we were running out of daylight and pushed it till the last bit of light but we had enough and we got it done, came back a few days later because we had some rain come in. Last day was clean-up, its so time consuming to mask it off, but pulling it off was a breeze!!…haha.. cleaned the surface really well after we pulled all the pattern tape and removed all the paper, now it was time for sealer! !….The sealer really makes the color pop and adds so much more dimension to any project we do, 2 coats and 8 hours later we were done with sealer and it was time for the Video and photo’s!